At 47 years old, Denny (McDermid) Ristow ’78 struggled to run a mile. So she challenged herself to get back in shape. Within six months, she was running half marathons. Within a year, she completed her first full marathon. “I just kept going a little farther, a little farther, a little farther,” she says. At 58, she decided to raise the bar. She joined CrossFit, an all-encompassing fitness regimen that aims to train the whole body through a mix of high-intensity interval training, weightlifting and other exercises. Now, Ristow (pictured, photo courtesy CrossFit Eastern Ridge) can deadlift 200 pounds – and she’s in the top 200 CrossFit athletes for her age bracket. That competitive streak is what’s driving Ristow up the rankings in the CrossFit Open, a contest in which hundreds of thousands compete worldwide. The top 200 athletes in each age bracket move on to CrossFit Regionals, the last round before the big event: the CrossFit Games. The CrossFit Open takes place over five weeks from February to March and requires participants to complete certain timed workouts once per week in their local “box,” or CrossFit gym. The second year she competed, Ristow was ranked 167 in the world in her age group, making it to the two-weeks-long regionals, where she finished at 138. This past spring – competing at age 62 – she was ranked 176 in the world at the open and jumped to 132 in regionals. 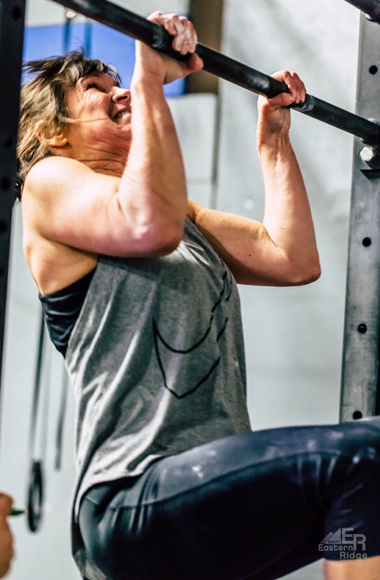 Only the top 20 in each age group at regionals make it to the CrossFit Games, and with younger competitors entering her age group each year, Ristow doesn’t expect to make it all the way. But she’s not done challenging herself. Her goal for next year: Break the 130 barrier in the regional’s rankings. To do that, she says she needs to work on handstand push-ups – push-ups done while upside down in a handstand – and other strength exercises. 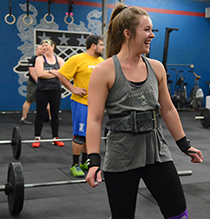 In addition to fueling her competitiveness, Ristow, general manager of InkWorks Printing LLC in Plymouth, Wis., enjoys the sense of community CrossFit fosters. She attends CrossFit five days a week, often working out with her daughter. CrossFit devotee Paige Bayer ’15 was likely St. Norbert College’s first competitive powerlifter. The clatter of free weights hitting the floor and athletes pushing their limits were sweet sounds for the business major, whose story ran in the Spring 2015 issue of St. Norbert College Magazine.